« Could we be edging closer to a Europe-wide 'iPod tax'? Imagine a world where your computer, cellphone, games console, storage devices, media streamers and other hardware all play nicely together, so that, for example, music, photos and video can reach the television or Hi-Fi no matter where in the home it originates. That world is one which the Digital Living Network Alliance (DLNA), an industry consortium backed by big name consumer electronics, computer and mobile device manufacturers such as HP, Microsoft, Nokia and Samsung, is aiming to create through support for the UPnP (Universal Plug ‘n’ Play) AV standard. For end consumers this means that any ‘DLNA certified’ device should, in theory, be able to share or access media on the same home network — a message that DLNA members have largely failed to communicate, which is especially sad considering that many people already own a number of compliant devices (see our recent guide to streaming media from a Mac to PlayStation 3). In this post we’ll explore the UPnP AV standard a little further, and pick out a few of our favorite supporting devices. UPnP AV devices typically either act as a server, meaning that they can stream media to any DLNA certified device, or as a client, in which case they can auto-detect UPnP AV servers on the network to browse and stream media from them. In some cases, a device can offer both server and client functionality, so that it can share as well as receive media, such as a PC with the appropriate software installed. Out of the box, any Windows PC with Windows Media Player 11 installed can become a UPnP AV server through the software’s media sharing feature. From the settings menu select Media Sharing and then choose which UPnP AV devices on your home network to share media to, along with which directories on your PC’s hard drive to make accessible: “My Movies” and “My Music” is a good place to start. In the above screenshot, the ‘Unknown Device’ listed is actually my PlayStation 3 (see below). Alternatives to using Media Player’s built-in UPnP AV functionality include TwonkyMedia, myiHome (free), Mezzmo and TVersity, which offers real-time transcoding for maximum audio and format support on receiving devices. Additionally, Winamp can also be used as a UPnP server in conjunction with the On2Share UPnP plug-in. Mac users have a few options, none of which are available out of the box. TwonkyMedia offers a Mac version, or there’s Elgato’s EyeConnect. 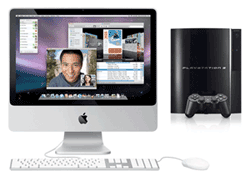 For those in need of a dedicated solution for streaming content from a Mac to PlayStation 3, we recommend Nullriver Software’s MediaLink. Likewise, for an XBox 360 solution try Connect 360 from the same company. Another Mac compatible application that can act as a UPnP AV server is the BitTorrent client and Internet TV application Vuze, through installing the optional Media Server plug-in. Content that you want to share with other UPnP AV devices needn’t be stored on a PC, and in fact you could discard the PC altogether through the use of a Networked Attached Storage device (a hard drive that can act as a server on your home network). Buffalo, for example, offer a range of NAS drives that can operate as a UPnP AV server, all the way up to four terrabytes in size, ideal for sharing even the largest of media collections around the home. A number of Nokia’s N Series devices including its flagship N95 cell phone and N800 Internet tablet can act as a UPnP AV server (see this guide). Just imagine taking a photo or video on your mobile phone and instantly viewing it on the television via a PlayStation 3! UPnP clients (known formally as Control Points) function as digital audio and video players, and are able to auto-detect UPnP AV servers on the network to browse and stream media from them. Again, right out of the box a Windows PC can operate as a UPnP AV client through the use of Windows Media Player’s Window Media Connect feature, and for the Mac there is Mediacloud (Intel-only). But the fun really starts when we get into non-PC UPnP clients. Both the PlayStation 3 and XBox 360 can operate as a UPnP AV client, making them an ideal way to get various media onto a television. Each console supports a limited set of audio and video formats, so that not all media files will work. It’s a good idea to make yourself familiar with what your console can support and design your media library around it. Roku’s line of audio steaming devices are DLNA compliant, making them ideal for streaming music stored on a PC or any UPnP AV server to your home stereo. And for streaming video to a TV, devices such as Popcorn’s HD player (with support for MKV) or Buffalo’s LinkTheatre incorporate a UPnP AV client, as does the Archos TV+. A number of televisions are available that offer a UPnP AV client including the HP MediaSmart range, and Loewe Connect LCD High Definition Televisions. All Archos’ 5th generation PMPs like the 605 and 705 can act as a UPnP AV client. The digital lifestyle holy grail: all media devices playing nicely together, hasn’t yet been reached by the Digital Living Network Alliance’s UPnP AV standard, but we are closer than ever before. It’s just that most people don’t know it. Having said that, not only is the message being communicated badly (‘DLNA certified’ means nothing to most consumers) but industry support could go a lot further. Missing in action is a major player like Apple, a company that has done more than most to simplify our digital lifestyles but whose ‘walled garden’ approach to digital media is apparent in its lack of UPnP AV support. Another challenge for the DLNA’s mission is that beyond devices talking to each other, there is still a lack of consistency in terms of what media formats each device can playback. Your PlayStation 3 might be able to recognize your PC but still won’t be able to play every video file it throws at it. This is very confusing to most consumers. And the use of copyprotection technology by many download services makes this situation even worse as there isn’t an industry standard for Digital Rights Management software. In theory I think that DLNA certification is a good idea, but I also think that they’ve botched it from the start. If you take a look at the current specs, all that is required for DLNA certification is support for .jpg, .bmp and other standard photo files, .mp3 files, and Mpeg2 files. While I’ve got no complaints about the photo or audio options, I do find the video support seriously lacking. In a digital world dominated by Mpeg4 and H.264 compression schemes, it seems silly to not have advanced codecs as a checklist feature for certification. While many of the DLNA devices will also support Mpeg4, because the MPEG2 standard is all that is required for certification, it creates confusion for those of us who prefer digital video. This opens up the possibility that a consumers will buy a DLNA device expecting that it will work with their video files, only to take it home and realize that they’ve got to convert their video into a less efficient compression scheme before their DLNA devices will support it. From what I’ve read, later this year DLNA is supposed to including Mpeg4 as a default for certification, but considering that VLC and H.264 is quickly becoming a must have feature for video CE products, it feels like DLNA is still a year behind the curve. My thoughts exactly, although, as I said, the branding needs to be improved too, alongside better video standards support. Having been very involved in the early days of UPNP AV and DLNA, I’ll pipe in here – the vision is, and always has been, awesome. The reality check is, in an unfortunate word, fail. You should have mentionned TVersity, which is by far the best UPnP server, with excellent real-time transcoding. We are currently working on adding real-time transcoding to Mezzmo and the next update will include this useful feature. Does anybody know if its possible to stream an online movie service like Hulu or Amazon Unbox to a DLNA client like the Popcorn Hour? Is it possible via something like Tversity? You cleared up so much for me. Thank you. Erm…You've covered Windows and Mac….No mention of Linux? Coherence, FUPPES, GMediaServer, uShare, GeeXboX, MediaTomb…etc etc. Good article…but far from complete.